Buildjournal V2.1 Update: Bimmerworld, HARD Motorsport, AST Coilovers and More! 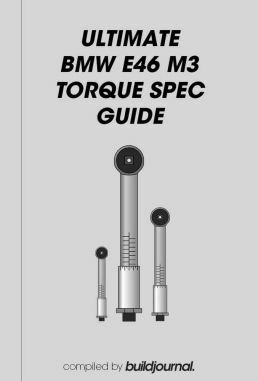 Sign up for our newsletter and receive a free copy of our Ultimate BMW E46 M3 Torque Spec guide as a little thank you. No need to pull out your phone and get it dirty while you're wrenching. Use our handy printable sheet to determine your torque values from oil drain plug to engine head.